The aspidosperma alkaloids belong to the family of monoterpene indole alkaloids which contains more than 2000 members. I think most of you are more or less familiar with their structures. Because of their broad structural diversity this family still challenges chemists to test new methodology. 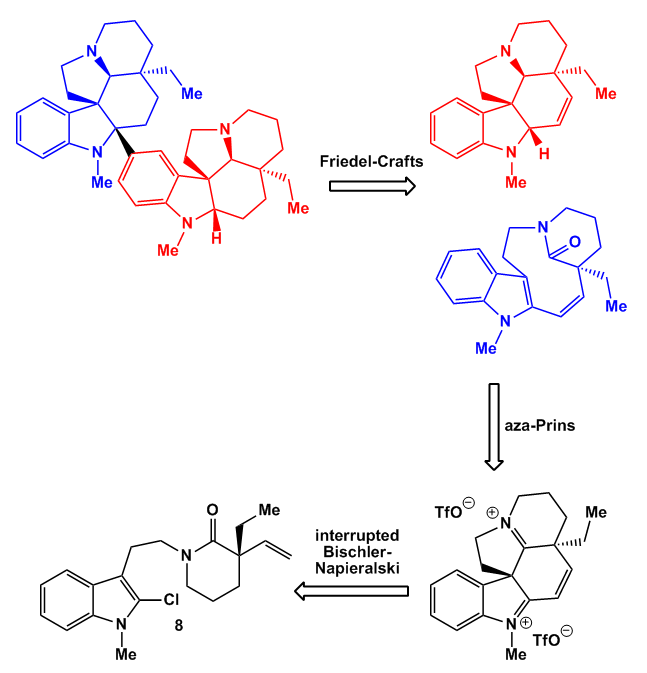 The Movassaghi group recently published this paper which contains an impressive Friedel-Crafts cyclization strategy to build up the framework in a concise manner. 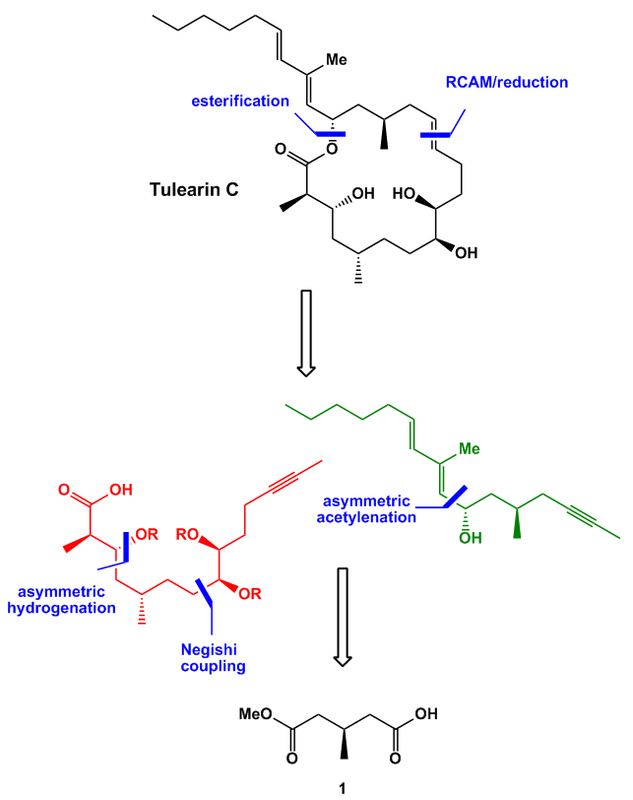 By the way three biogenetically related group members were synthesized and some analogous compounds. The group planned to access all three natural products through a common precursor which can be obtained via an interrupted Bischler-Napieralski reaction. Fragment 8 was synthesized utilizing Myers asymmetric alkylation strategy. Pseudophenamie 1 was acylated with crotonyl chloride to give amide 2 which in turn was deprotonated and alkylated to give 3. By doing so the endo-double bond was transformed into a terminal olefin. Another alkylation introduced the ethyl group while retaining the stereochemistry at the a-position. 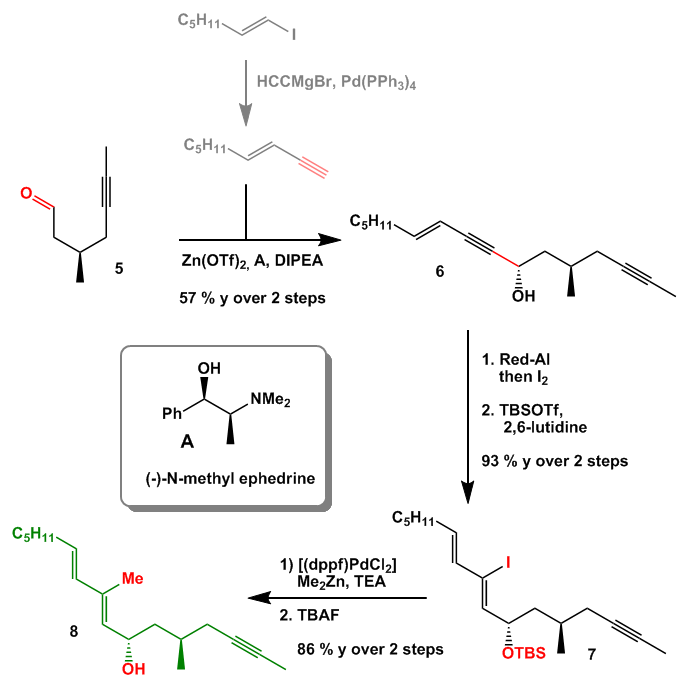 TES protection of the auxiliary was necessary to overcome problems in the following alkylation/ring closing step. Coupling partner 6 was obtained through methylation and chlorination of 5 in a straightforward manner. 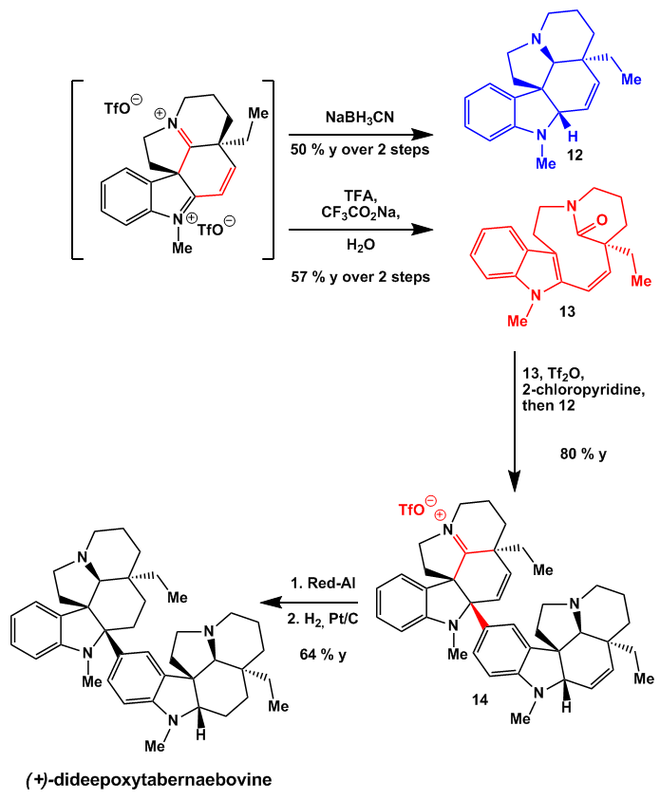 Alkylation of 6 with 4 was achieved with KH in the presence of TBAI to give acyclic precursor 7 in high yield. Next the nosyl group was removed with PhSH. 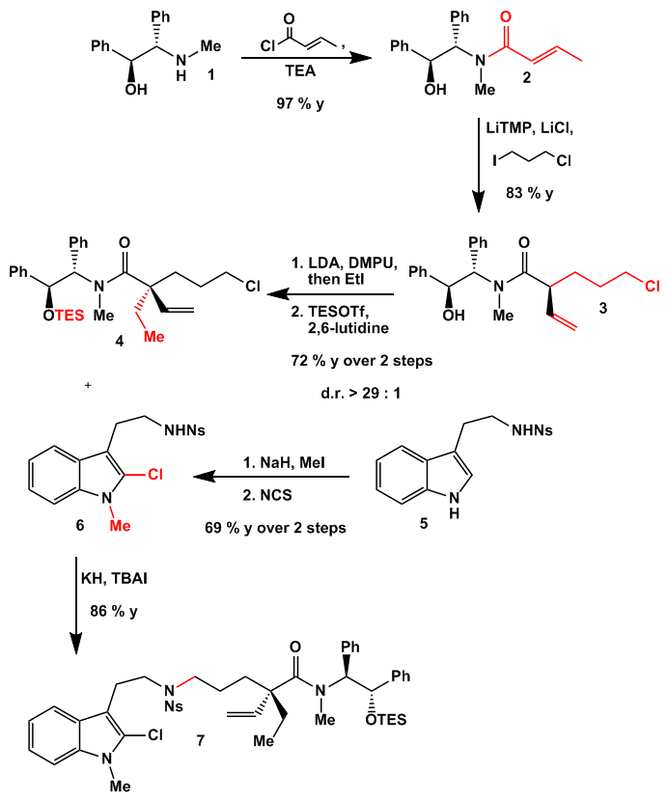 In one pot the TES group was cleaved which resulted in the expected N à O acyl transfer. The ester then easily formed lactam 8 with complete recovery of the auxiliary in almost quantitative yield. Triflation of lactam 8 in the presence of the slightly basic 3-cyanopyridine produced the key diiminium ion shown. Depending on the following steps a lot of derivatives can be accessed. Employing first borohydride reduction and hydrogenation (-)-N-methylaspidospermidine was obtained. Using a buffered aqueous solution of TFA the diiminium salt was hydrolyzed, the double bond hydrogenated, and the carbonyl functionality reduced with LAH to give (+)-N-methylquebrachamine. Going half the way from the diiminium ion (which means leaving the double bond in place) coupling partners 12 and 13 were obtained. Again forming the diiminium ion from 13 in the presence of 12 iminium ion 14 was generated. Reduction with Red-Al and hydrogenation then gave (+)-dideepoxytabernaebovine. For clarity I put the mechanism of the Friedel-Crafts chemistry below. Triflate formation is straightforward. 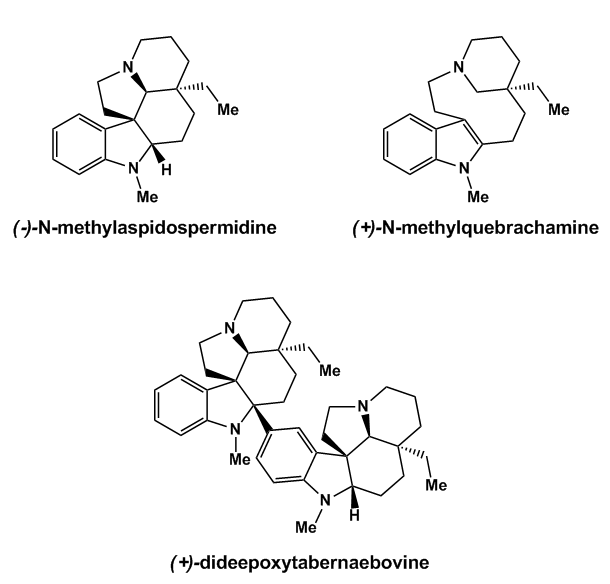 The following spirocyclization is controlled by the quaternary stereocenter. Most likely the ethyl side chain poses greater steric repulsion and the vinyl group might exhibit some sort of attractive secondary orbital interactions. The formed indoleninium ion then underwent aza-Prins cyclization to give after HCl elimination the diiminium ion used for further modifications. Extremely cool chemistry. I skipped to show all the analogs the group synthesized by the way but you really should have a look in the paper. It is highly recommended. It was found that during the coupling step the resulting free amine after N àO acyl transfer underwent intramolecular alkylation with the chloride to close a lactone ring. Because of the large phenyl groups the amide nitrogen has almost no chance to overlap its non-bonding s-orbital with the antibonding p*-orbital of the carbonyl group. So the normally partial double bond character of the amide bond is weakened. On the other the free alcohol oxygen is very close to the amide carbonyl so that an acyl transfer should be really fast. I can only guess why this transfer is observed, maybe you have another explanation for that? As nucleophiles the group employed for example Grignard reagents, allyl silanes, enol esters, or electron-rich arenes. Big big thanks to Bobby for proofreading and additional question/suggestions. This time I will present to you a real beasty of a molecule. It belongs to the class of the chlorosulfolipids which gained some synthetic interest in the last few years. Their biological profiles combined with the low supply of material drives researchers to produce some quantities for biological evaluation. Nevertheless from a synthetic point of view the development of asymmetric halogenation reactions is a growing field which can be further examined during the synthesis of such complex tasks. As can be seen from the structure it contains no less than 15 stereocenters of which 9 are contiguous and 9 are chiral chlorine atoms. In the light that only a handful of tactics for asymmetric chlorination reactions are known to date this is an extremely challenging task. We start off with two precursor molecules whose syntheses are described in the supporting material which I highly recommend for reading because it contains a lot of useful information about NMR analysis of chiral chlorine bearing carbon atoms. The first intermediate stems from commercially available (S)-1,2,4-butanetriol 1 which was protected as the acetonide, coupled under Mitsunobu conditions with phenyltetrazolylsulfide which in turn was oxidized to the sulfone. Julia-Kocienski olefination gave a mixture of E/Z-isomers which were isomerized to the major E-isomer under photolytic conditions to give 4. The more reactive g,d-olefin was dichlorinated with tetraethylammonium trichloride with a d.r. of about 1.8 / 1 which can be further enhanced after epoxidation because of the easier separation of diastereomers. 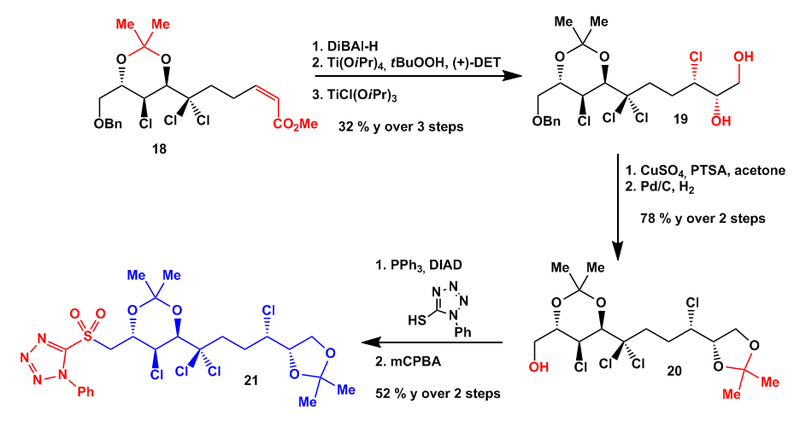 DiBAl-H reduction of the ester was followed by acetylation of the alcohol, stereoselective Sharpless dihydroxylation, and regioselective epoxide formation upon treatment with triflic anhydride. The overall yield of this sequence is only 9 % but during these five steps four of the fifteen stereocenters are formed. 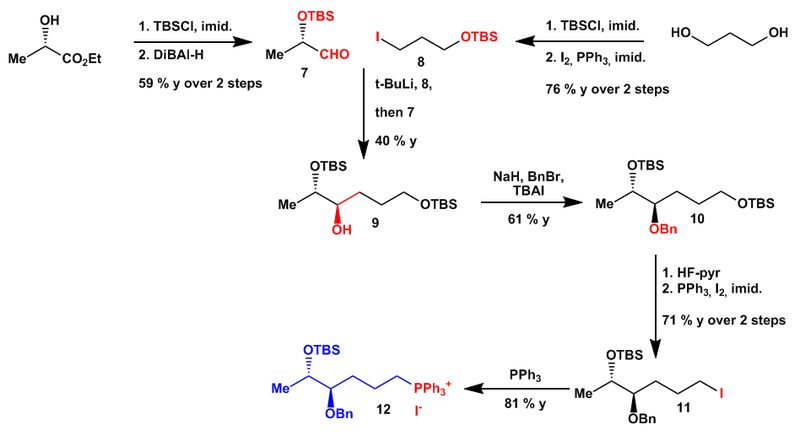 5 was subjected to acetonide cleavage conditions and the resulting diol was protected as the bis-TBS ether of which the primary alcohol was again set free with HF – pyridine to give 6. Oxidation of the terminal alcohol to the aldehyde and Wittig olefination with phosphonium salt 12 gave 13 whose double bond was again dichlorinated to give after deacetylation compound 14. Fragment 12 stems from two commercially available building blocks. On one hand ethyl lactate was protected and selectively reduced to aldehyde 7 while on the other hand propanediol was monoprotected and iodinated under Appel conditions to give iodide 8. Diastereoselective alkylation with the lithium reagent derived from 8 then furnished alcohol 9 which in turn was benzylated, and converted after selective monodeprotection into iodide 11 which gave Wittig salt 12 in the presence of triphenylphosphine. The second half of the molecule derived from pentanediol. Monoprotection, Ley oxidation and dichlorination with NCS produced aldehyde 15. 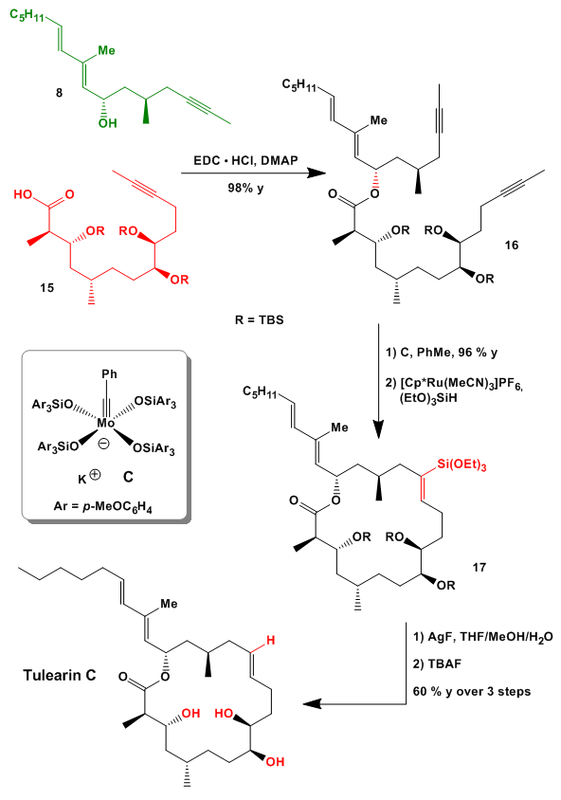 Next asymmetric alkynylation under Carreira’s conditions gave 16 with excellent enantioselectivity. 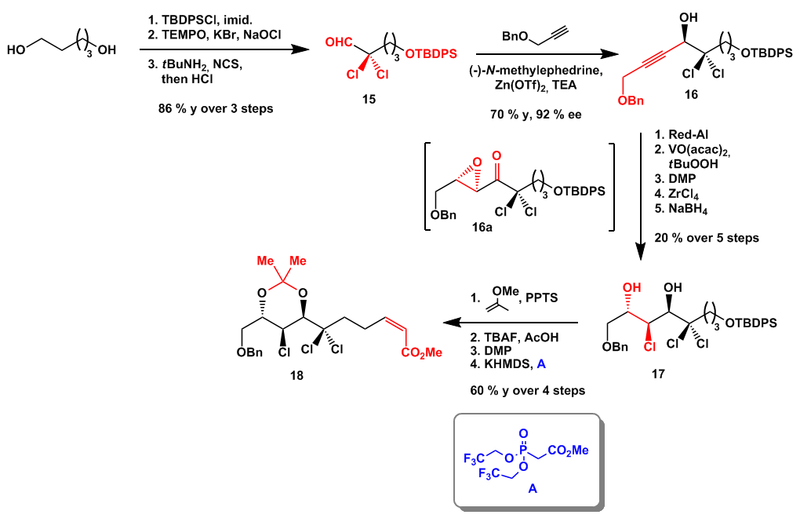 Semireduction of the alkyne and hydroxy directed epoxidation of the trans-alkene necessitated DMP oxidation of the alcohol because no suitable conditions for selective epoxide opening could be identified. 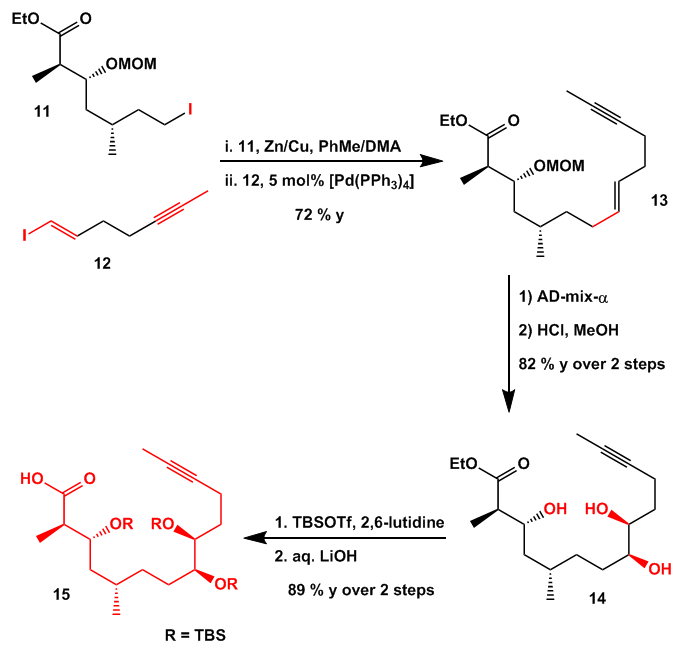 Thus ZrCl4 mediated epoxide opening of 16a and stereoselective reduction of the ketone gave diol 17. 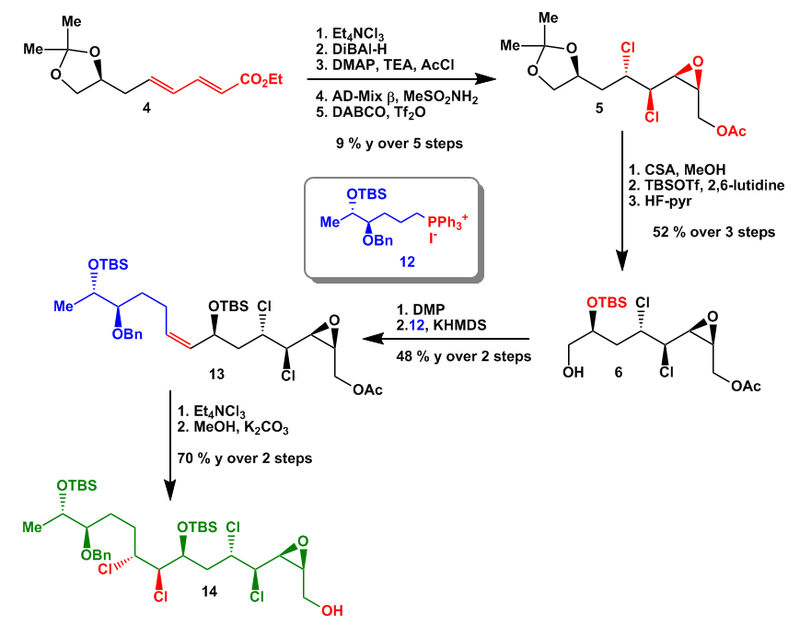 To the end the diol was protected as an acetonide, the TBDPS group removed, the terminal alcohol oxidized, and reacted with Still-Gennari modified HWE reagent A to yield 18. 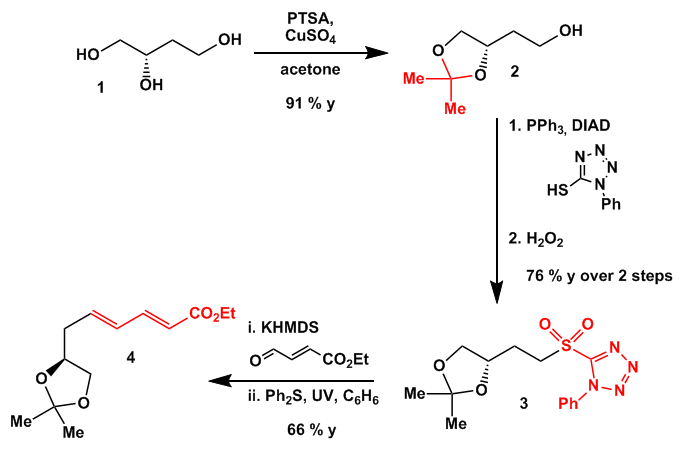 Going on with the synthesis ester 18 was successively reduced and the resulting allylic alcohol exposed to Sharpless asymmetric epoxidation reaction conditions. 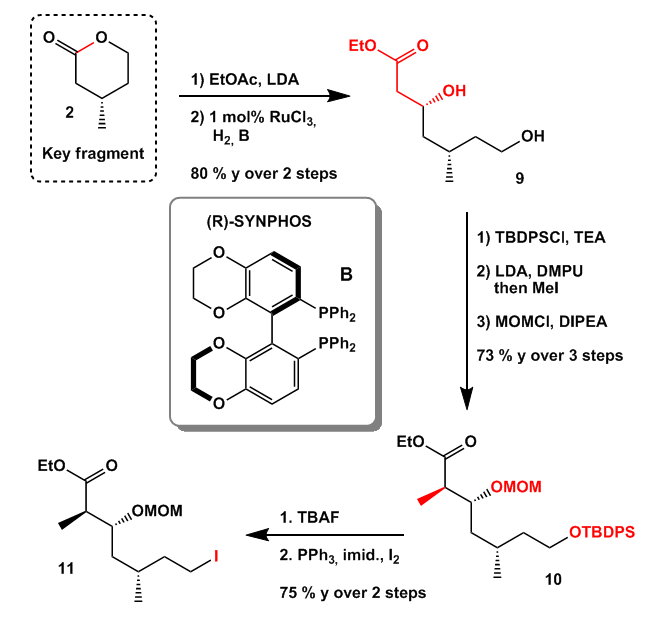 The epoxide was then regioselectively opened to give diol 19. 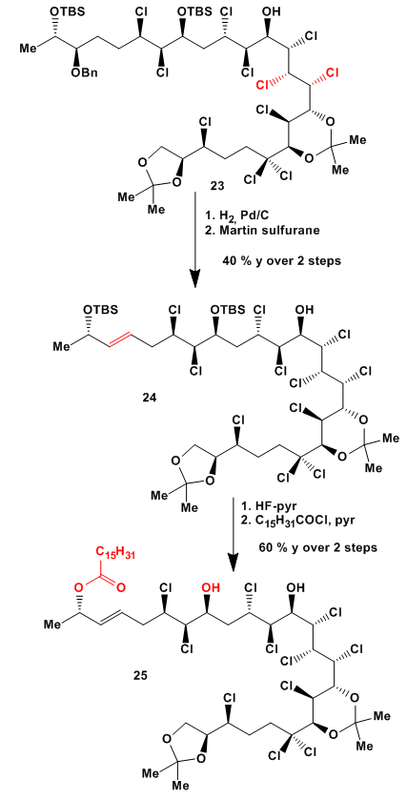 Acetonide formation and debenzylation was followed by Mitsunobu coupling and oxidation to yield sulfone 21. Fragments 14 and 21 were coupled under Julia-Kocienski conditions after prior DMP oxidation of the terminal alcohol of 14. Subsequently the epoxide of the intermediate was opened with PPh3Cl2 to give alcohol 22. Stereoselective dichlorination of the double bond then gave 23. To the end 23 was debenzylated and the resulting alcohol used as a handle to introduce a double bond with Martin sulfurane. 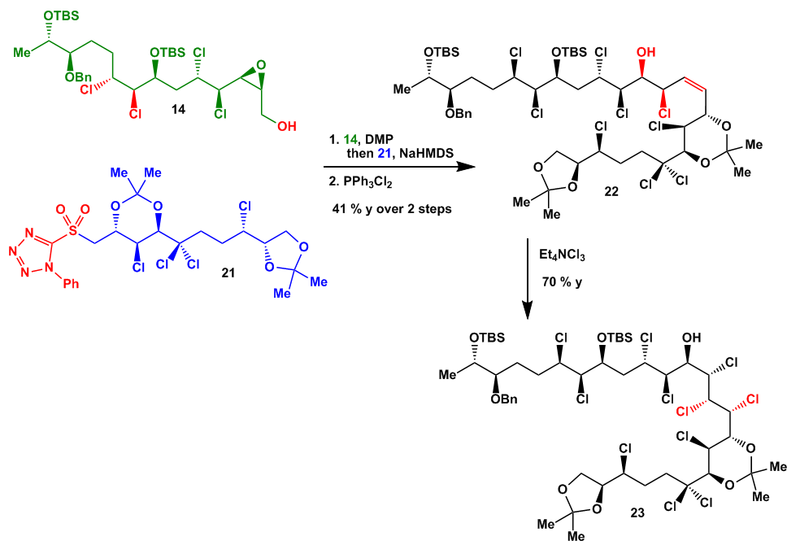 TBS removal and selective esterification with palmitoyl chloride gave protected Undecachlorosulfolipid 25. 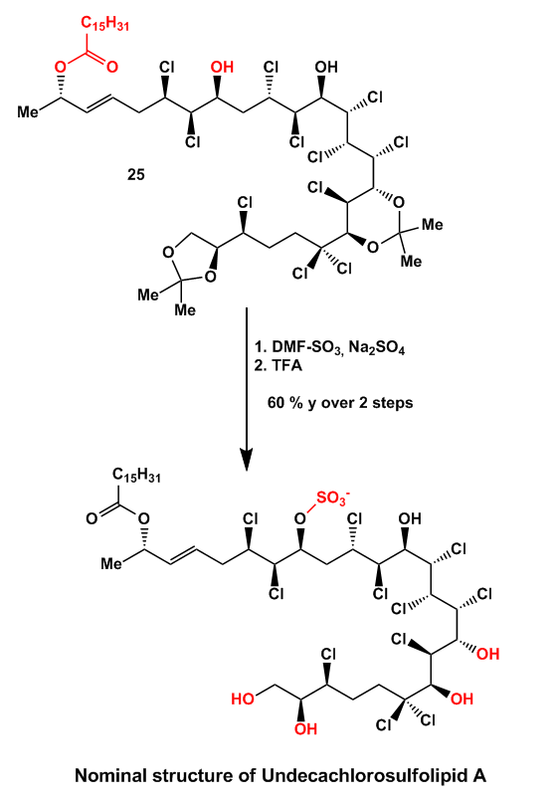 Conversion of 25 into Undecachlorosulfolipid was then accomplished first by sulfate introduction with SO3 in DMF followed by acetonide cleavage with TFA. 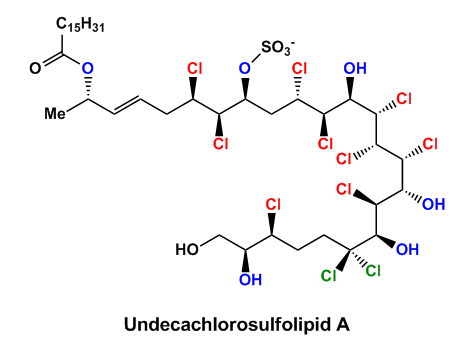 With a few µg of Undecachlorosulfolipid A in hand the group compared the analytical data of their lab work to the reported data and noticed that the compounds were not identical. Especially the assignment of the ester bearing hydroxy group caused some problems. 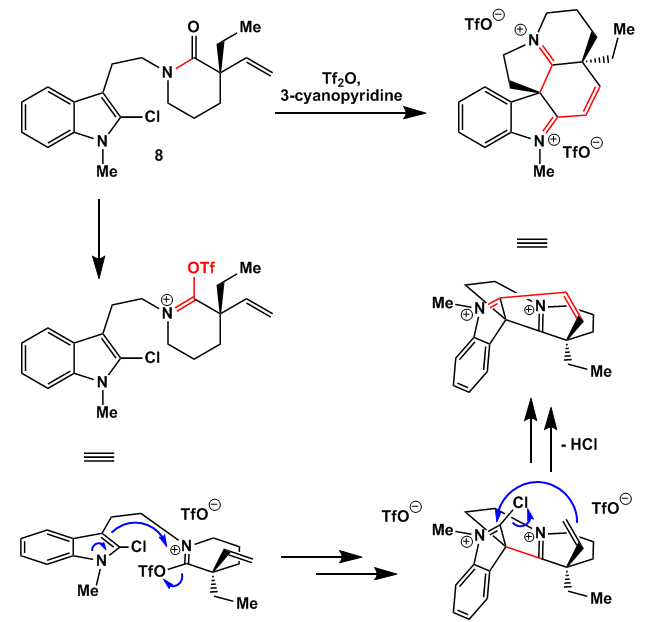 It was assumed that the stereochemistry should be R instead of S.
Well… nevertheless congratulations to the group to get this synthesis to work. Hopefully there will be a full account of this work showing all their tactics. THX to Bobby for proofreading! Hello again! 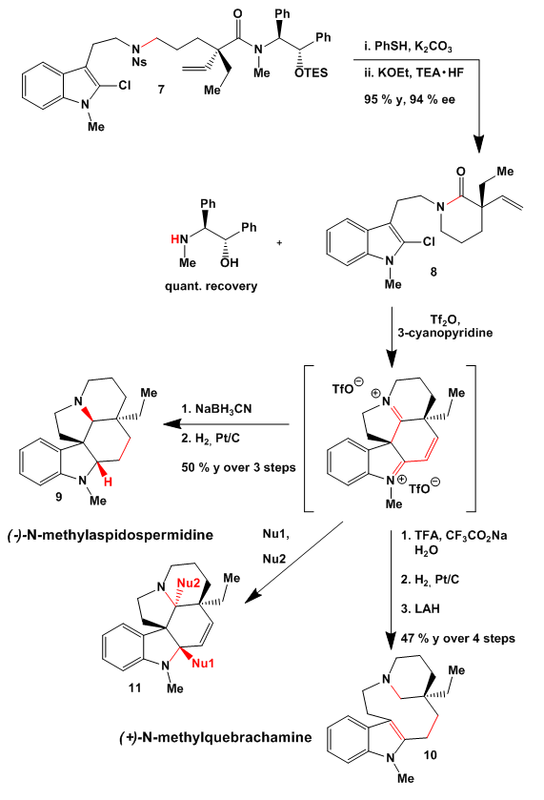 It’s almost a month ago since my last post so I decided to dig out this short synthesis with some nice new chemistry in it as mentioned in the headline. This time an interesting halogenated natural product (chosen to demonstrate their powerful method) with only 3 stereocenters of which 2 were captured by chlorine. This class of Napyradiomycins exhibit antibacterial activity against methicillin- and vancomycin-resistant strains and some anti tumour activity (some infos about MRSA can be found here: http://en.wikipedia.org/wiki/Antibiotic_resistance). They planned to use the isolated olefin for their asymmetric chlorination, install the alcohol and rearrange it to build up the allylic chain on the benzoquinone ring system. It was further planned to cyclise the bis-unsatured chain to get Napyradiomycin B4 but these results will be presented in a follow up publication. The basis of the synthesis is flavion which was synthesised earlier by other groups in a relatively long 8 step reaction sequence. They shortened it by heating the sulfonic acid salt in an alkali fusion and let the air do the rest. The resulting flavion was reacted with methyl crotonaldehyd under acid catalysis to give the ABC-ring system via a tandem Knoevenagel/6-π-electrocyclization followed by protection of the non-conjugated hydroxy function. The resulting tetrahydropyran fused ring system was exposed to the chlorination conditions which yielded the expected product in 87% yield with 93% e.e. after crystallisation. 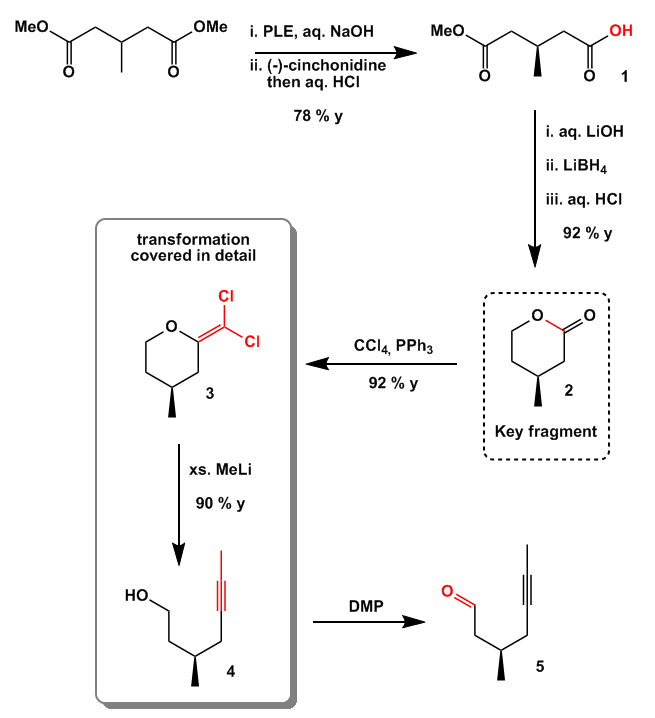 The conjugated chlorine was changed to an acetate with retention of configuration and after protection of the other hydroxy function and acetate cleavage, the second key intermediate was readily prepared. The adjacent carbonyl function may act as an electron pair acceptor throughout the whole addition/elimination reaction. 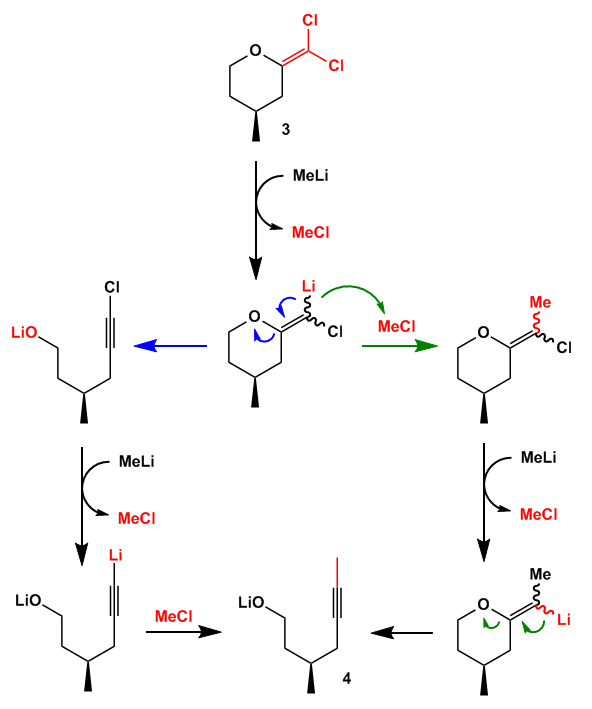 The in situ formed SmI2 acts as a Lewis acid and removes selectively the acetyl protecting group. The second half of the synthesis starts with a Johnson-Claisen rearrangement followed by a conjugate reduction with KHBPh3 as the reducing agent. It’s the first time I met a reagent for this kind of reduction without making use of a copper containing reagent. After ester reduction and re-oxidation with Dess-Martin periodinane the resulting aldehyde was used for a Wittig-olefination. The second chlorine was introduced stereoselectively with NCS and the protecting groups cleaved with MgI2 and PPTS to give enantiomerically pure Napyradiomycin A1. The supporting information also features a synthesis of the ligand used in the asymmetric chlorination if you’re interested in trying it by yourself. So that’s it for the moment. Suggestions are welcome.